This post tells you the basic tip about how to receive text messages on iPad Pro by using Text Message Forwarding feature of iPhone, suitable for iOS 8.1 and higher. Download AnyTrans to transfer messages, contacts, photos, songs and other types of files from iPhone to iPad, ready for iPhone 6s, iPad Pro and iOS 9.2. You may have bought one Apple new-released iPad Pro. When watching videos or playing games on your iPad Pro, have you ever thought about receiving SMS on iPad without unlocking your iPhone? Actually, iOS 8.1 and higher version of iOS enables you to make it. 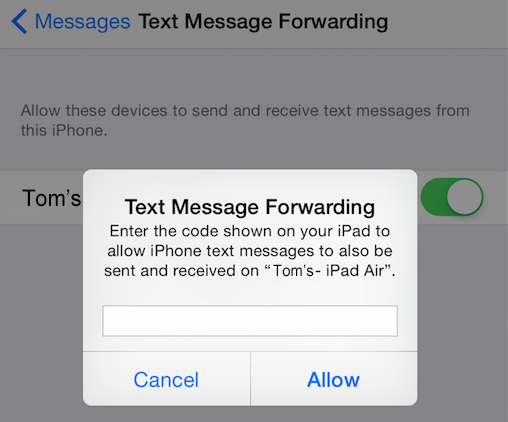 With Text Messages Forwarding feature, you can forward iPhone messages directly to your iPad, iPod touch and Mac computer. Requirements: You should make sure that both of your iPad and iPhone are running in iOS 8.1 or higher and they are connected to the Internet. In addition, you should login these devices with the same Apple ID. Step 1. 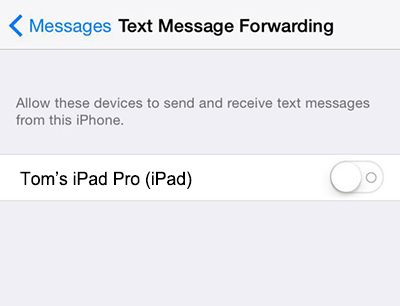 On your iPhone, go to Settings > Messages > Text Message Forwarding, select and toggle on the iPad Pro you want to forward iPhone text messages to in the devices list. Step 2. Get the code on your iPad Pro and enter it on Text Message Forwarding pop up-window and click “Allow” to connect your iPad Messages app with your iPhone’s. This post can be applied to receiving iPhone messages on iPod touch, Mac and another iPhone. And you are also suggested to read our AnyTrans tutorial about how to transfer messages from iPhone to iPad. Thanks for viewing and welcome any comments about how to receive text messages on iPad Pro.